This study can be used for a five, seven or thirteen week small group study. It will walk you step-by-step through the journey of letting go, pressing on and plugging into the power, the highest potential that dwells in every believer. 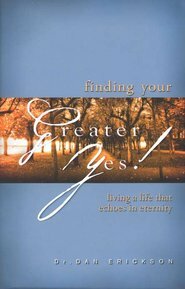 As a companion to Finding Your Greater Yes! this study will help you open yourself up to the plan God has for you, and provide you with the resources to start living a life that echoes in eternity.